Memories are one of a mother’s most cherished possessions. Looking back at old photos brings all the thoughts and emotions flooding back, just as if you were standing there taking the photo all over again (because lets be honest it usually is us mums behind the camera rather than in front of it!) one grubby little face peering back at you from the screen can elicit giggles and tears all at the same time. But that is just the problem. Well it is for me anyway. The majority of our photos from the last decade are all safe and sound on CD’s, hard drives, SD Cards, Cloud storage etc. I have minimal photos actually on display, and this is something that needs to change! So this Mother’s Day I’m releasing my photo’s from their digital safe houses and bring them to life with the help of Truprint. I’d never been on the Truprint website before as I’d always thought getting photo gifts would be really expensive, so I was pleasantly surprised to find that prices actually start as low as £2.99 and there are quite a lot of gifts available for under £10. I had originally planned on buying things for the grandmothers but I have to admit I got a little carried away and bought all my own Mothers Day gifts , well…If you can’t spoil yourself on Mother’s Day, when can you? Sorry Mam! So what did I treat myself to? Well, I have had a few technical issues my end, with my laptop suddenly deciding it didn’t like me copying images into a web browser (this is an ongoing problem and I had no issues using the website at all), so I’m still waiting for my goodies to arrive so I don’t have any real life images for you but here is an idea for you. So why did I choose these? Well, ever since O’s Christening and we were given our first photo canvas I have slightly fallen in love with them and I just adore this picture of O that was taken at a local castle we enjoy playing in during the summer. For £24.99 this 10×8 wraparound canvas was a must in my eyes. Next up we have the good old notepad, every writer’s must have, and for only £6.99 with lots of personalisable options available I thought this was really good value. This picture was taken the same day as the one on the canvas and is a rare one where they are all facing the camera! Underneath it says ‘My favourite reason to lose sleep’. Finally, we have the travel mug. I spend many an afternoon sat in the car waiting to pick up various kids from various afterschool activities and a travel mug of coffee truly is my best friend, especially on a cold winters day. 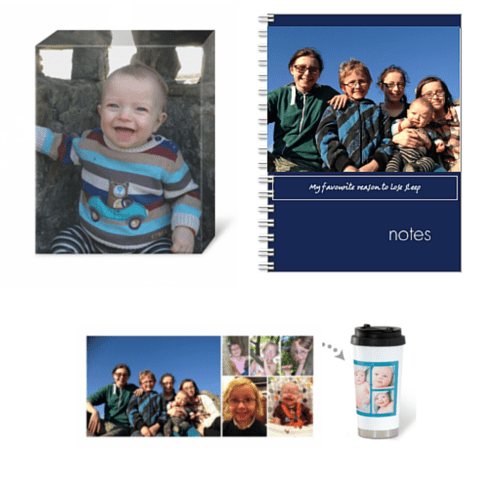 I chose the same image as on the notepad for my featured picture and added my favourite close ups of all of the kids too. You can have writing on the mug as well as a coloured border but my images looked better without. This cost £14.99. Another great option for Mother’s Day is Truprint’s personalised photo cards. There’s a wide variety of designs to choose from and prices start at a mere £1,99 so there really is something for everyone. This year Truprint want to make a million mums smile and are giving away 1 million free personalised Mother’s Day cards in their ‘Mum in a Million campaign’. You can claim yours by visiting Truprint’s Mothers Day card section to create your card and by using the code: MUMINAMILLION at checkout. So that’s my Mother’s Day sorted, what are you hoping to get?